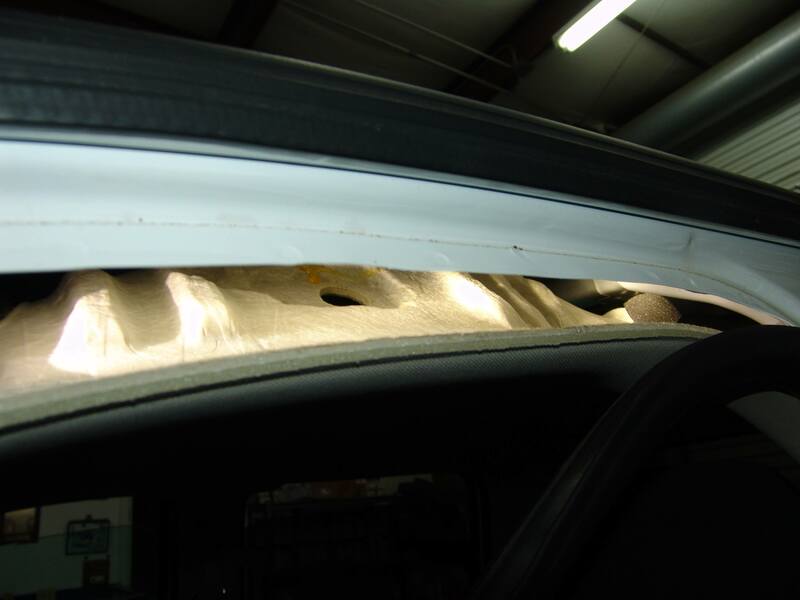 This 2009 Chevrolet Silverado came in with the complaint that the heater was only mildly hot unless the temperature was set to 90°F. When set to 90° the heat worked very well. 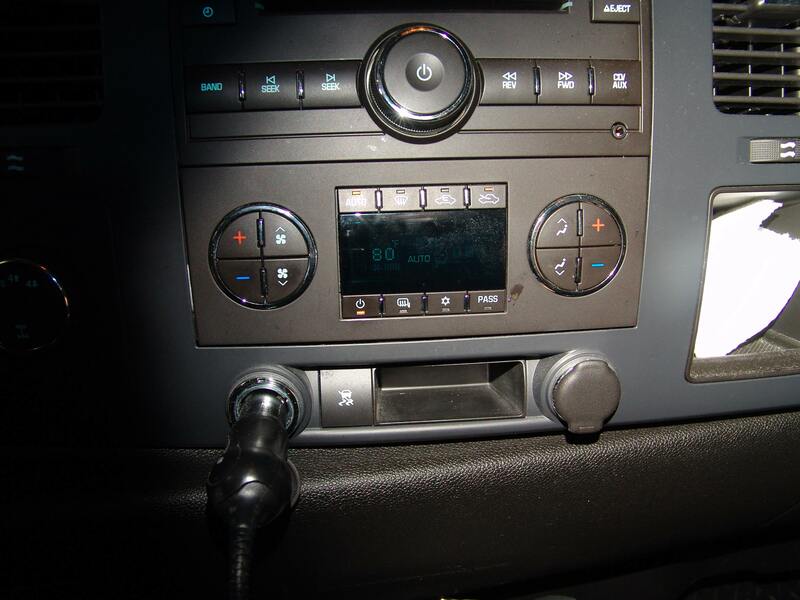 I should point out that this truck has automatic HVAC controls as evidenced by the word “Auto” on the control head assembly. I also want to let you know that this symptom generally applies to most GM vehicles built after the 2000 year model with automatic temperature controls. I had already looked at data and saw that the interior temperature sensor was reading higher than it should by 10° to 15° Fahrenheit. 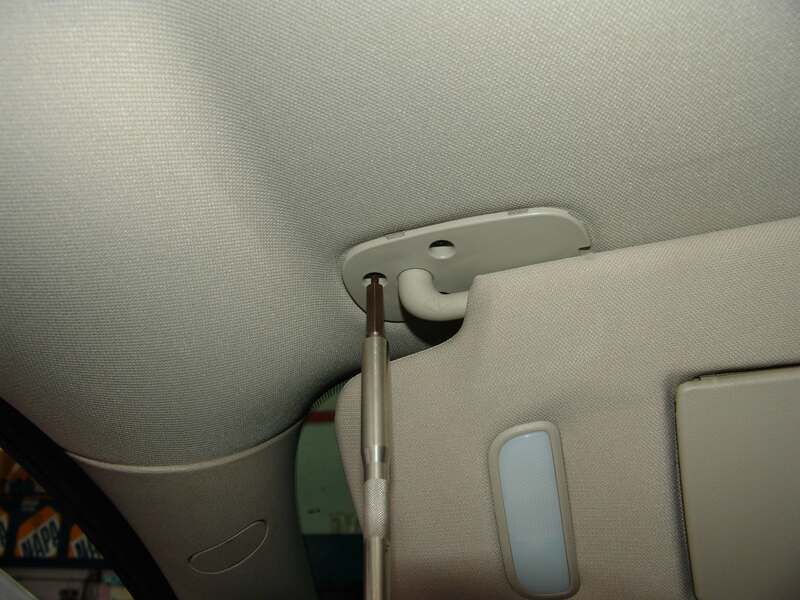 The interior temperature sensor is located above the driver’s head and contrary to popular belief it is not a speaker or a microphone for the OnStar system. It is a very neat little sensor but it is actually much more than just a sensor. It has a built in fan that draws air in from the passenger compartment. 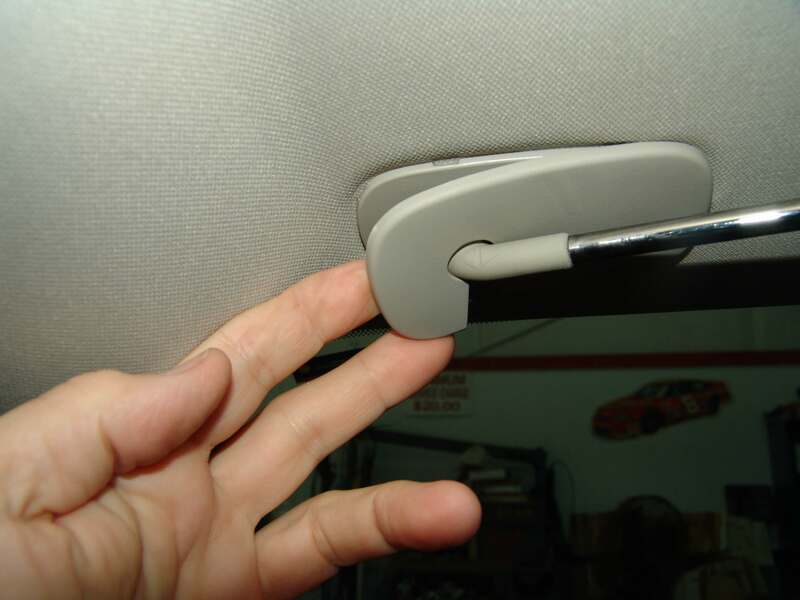 The created air flow forces cabin air across the thermistor and with the use of various electronics converts that information into a temperature value that the HVAC module uses to adjust the temperature door actuators. If the temperature reading is too high the system will keep the cabin cooler than desired because it is trying to lower that false high temperature. The chief cause of failure of these sensors is dirt/dust and I will show more of this later. 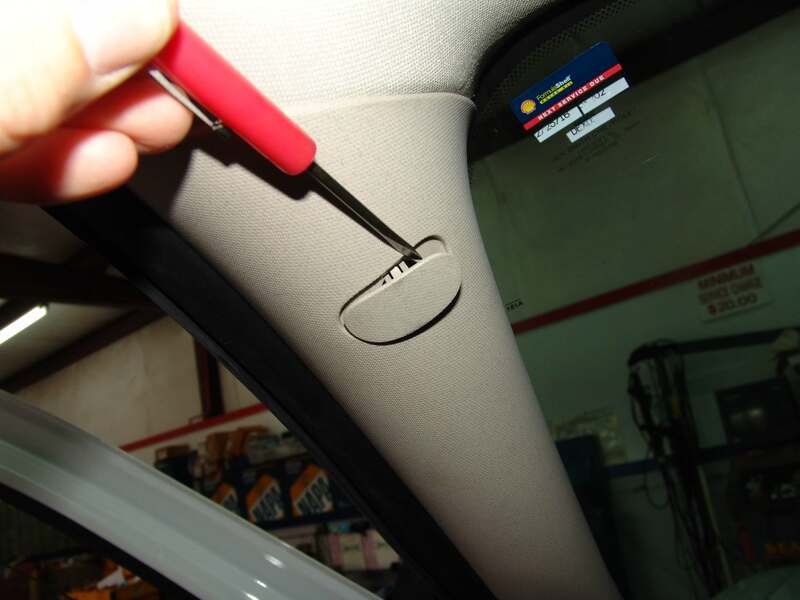 GM service information states to disable the SRS system, remove the front and rear sill plates, remove the lower center garnish molding and then finally the upper center garnish molding. I prefer to save time and only loosen the upper panel. 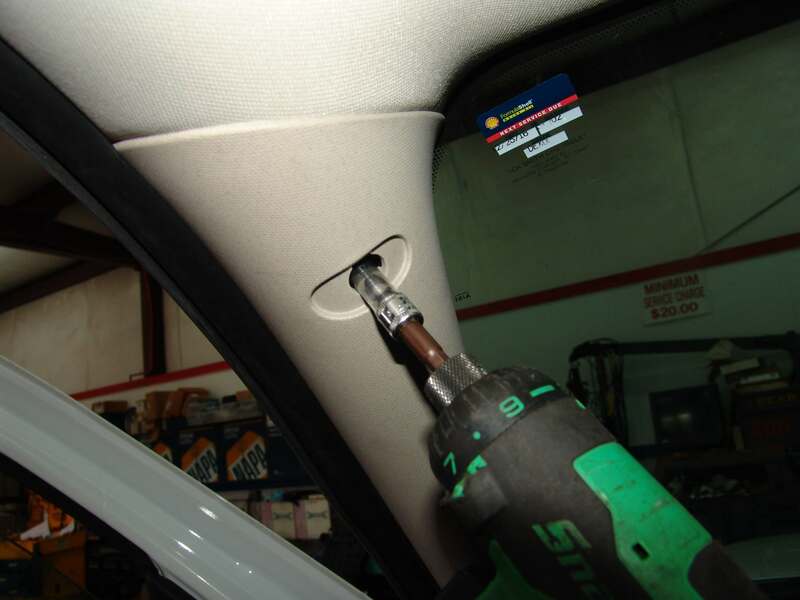 First the screw cover panel has to be removed. 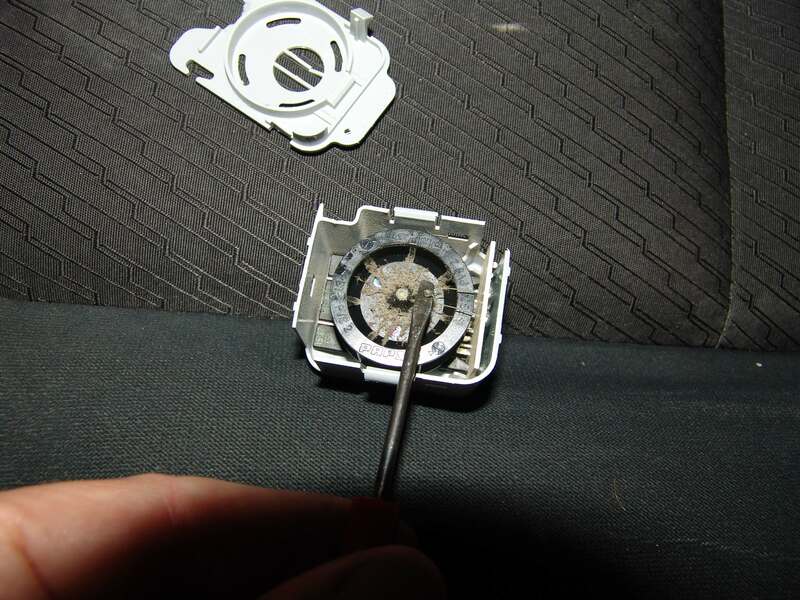 Then one screw with a 7 mm head has to be removed from the forward hole. 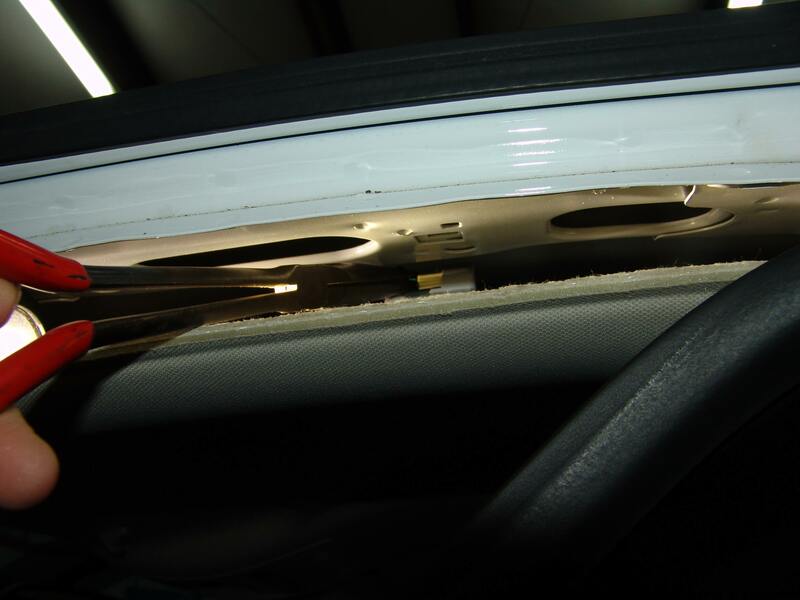 The panel can now be pulled towards the center of the vehicle a couple of inches. The driver’s sun visor needs to be removed from the vehicle. Start by grasping the cover panel at the outer edges and working it free from the base. 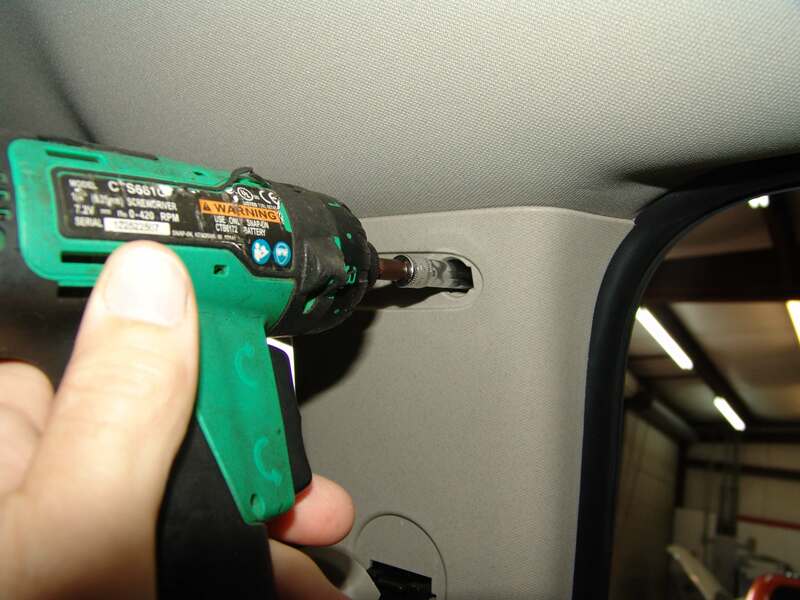 There are three T15 torx screws that hold the visor assembly to the roof of the truck. 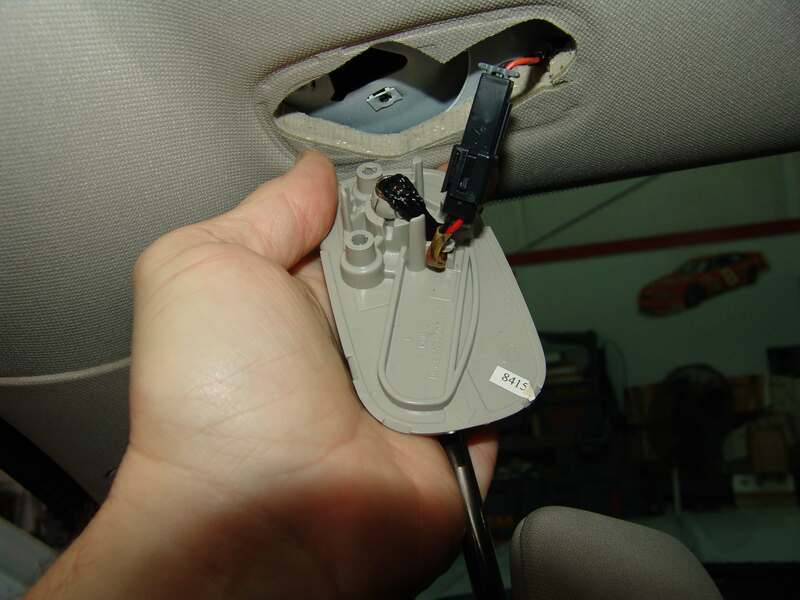 Pay attention to how the wires and harness pull out of the headliner. You will need to remember this for re assembly later. Next the “A” pillar trim panel has to be removed. 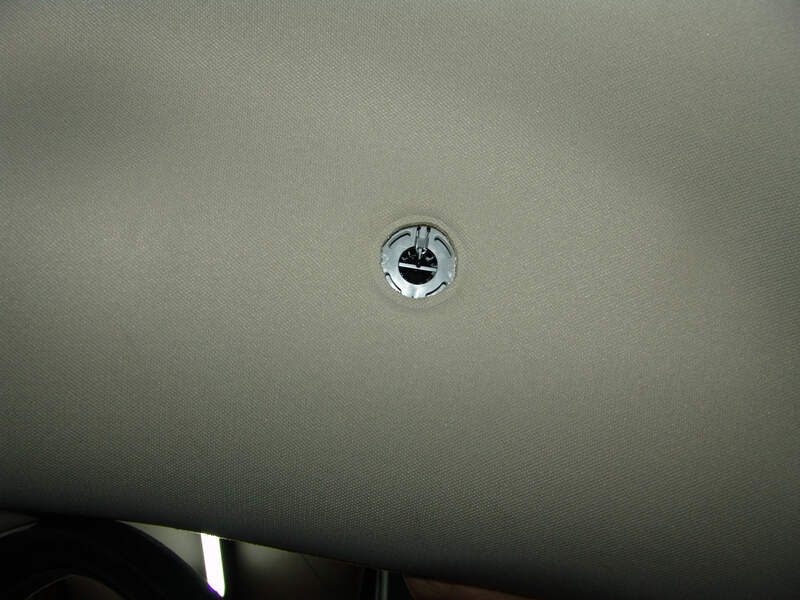 First the screw cover panel. Then the 7 mm screw. If there is a pull handle installed at this location it will need to be removed and there will be another screw at the other end. With the screw removed the upper edge can be pulled down to release the retainers. 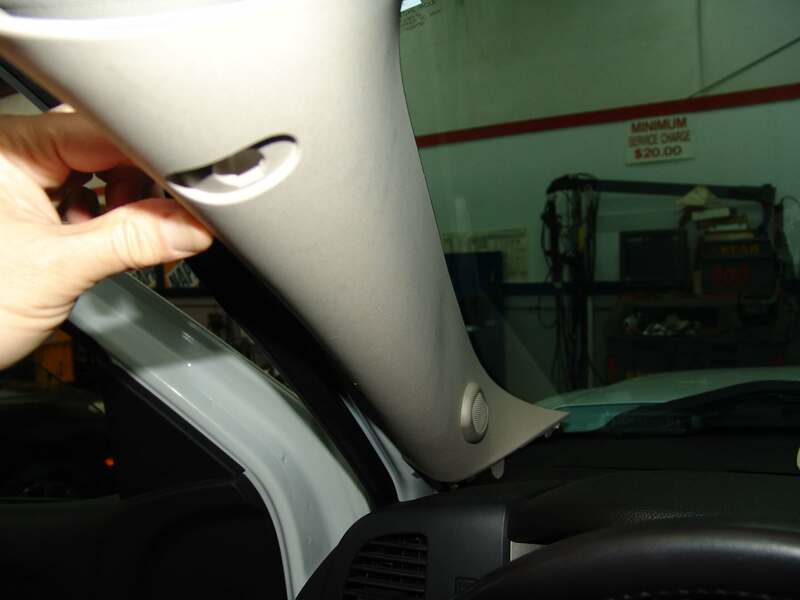 Then the entire panel will be lifted up and off of it’s resting place on the dash cover. 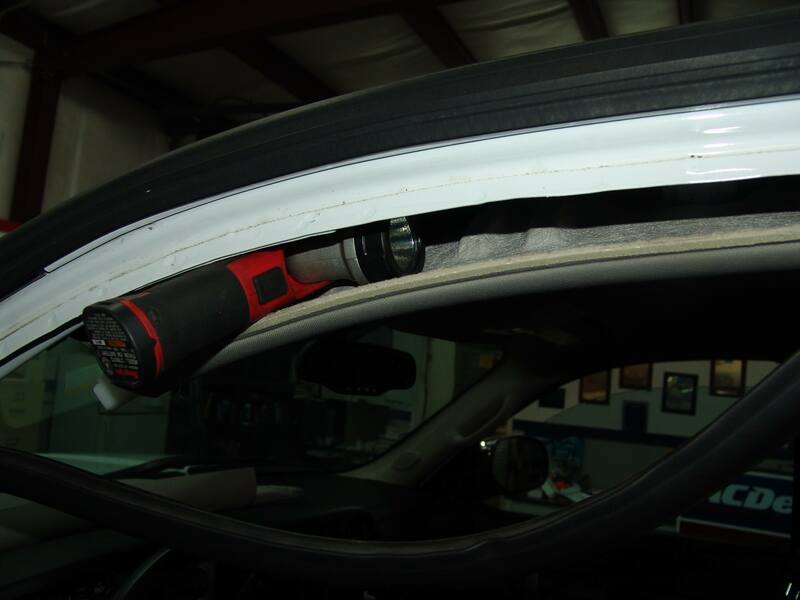 The door weatherstrip can be pull down and off of the metal lip. 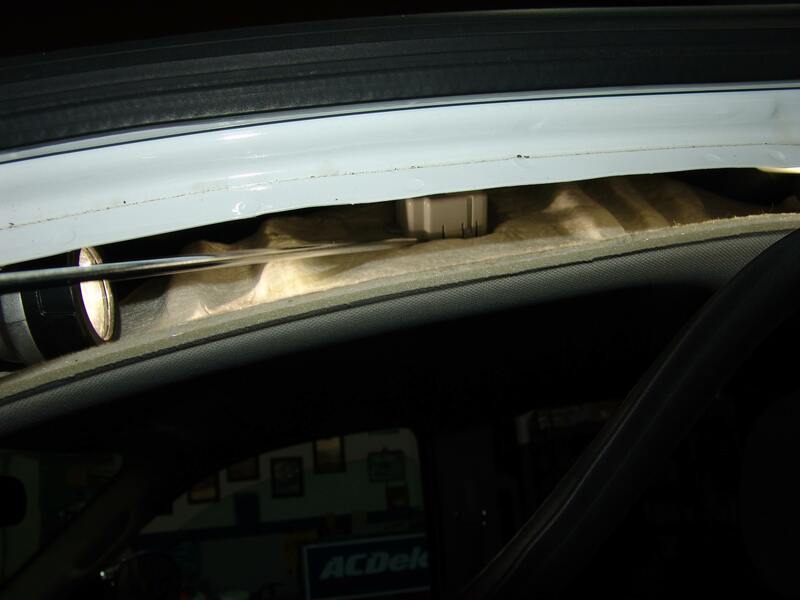 Now I carefully pull down on the headliner assembly and use my flashlight as a wedge to hold it down slightly. 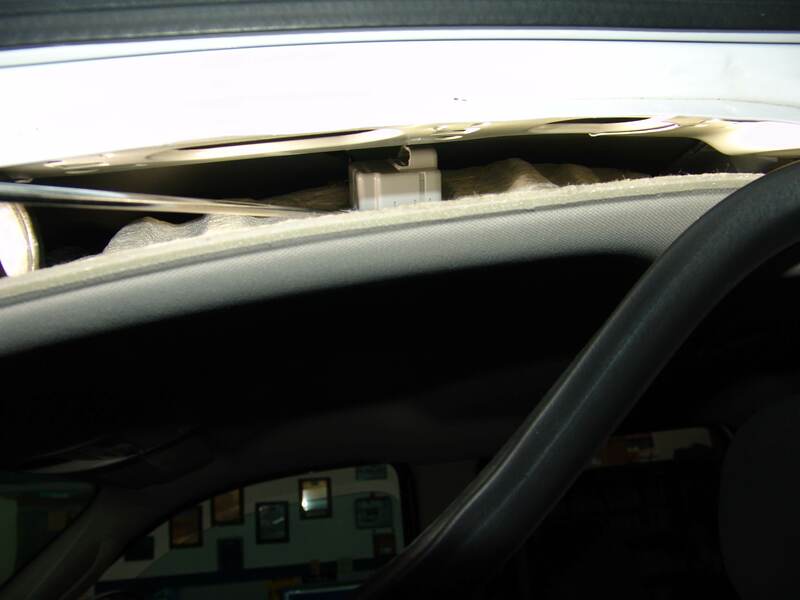 Again I said carefully because the headliner can be damaged if over flexed. I use long needle nose pliers to grip the harness and a long flat blade screw driver to lift the locking tab on the sensor. I could not hold both tools and the camera all at the same time so you will need to use your imagination here. Since I know I am going to install a new sensor assembly I am not concerned about “saving” the old one. In fact I intend to break it. 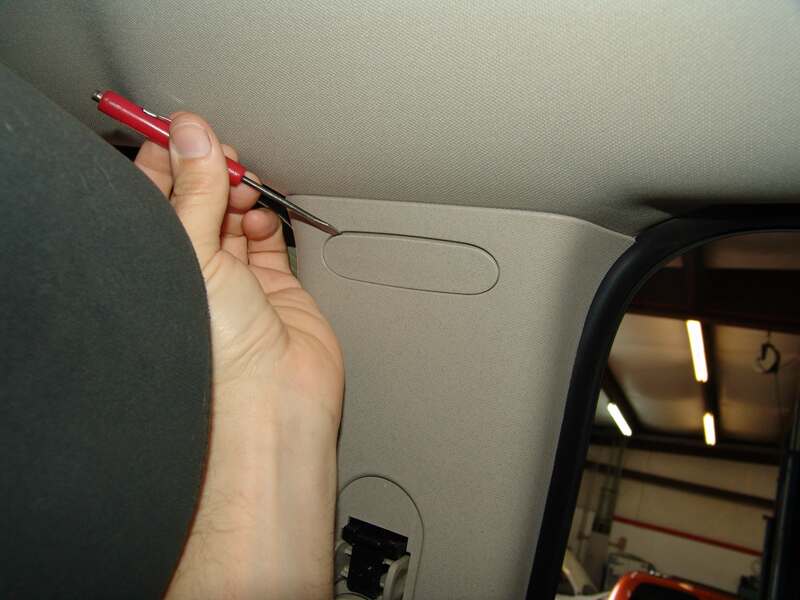 Using a couple of long flat blade screw driver’s I flex and pry the sensor away from the headliner. 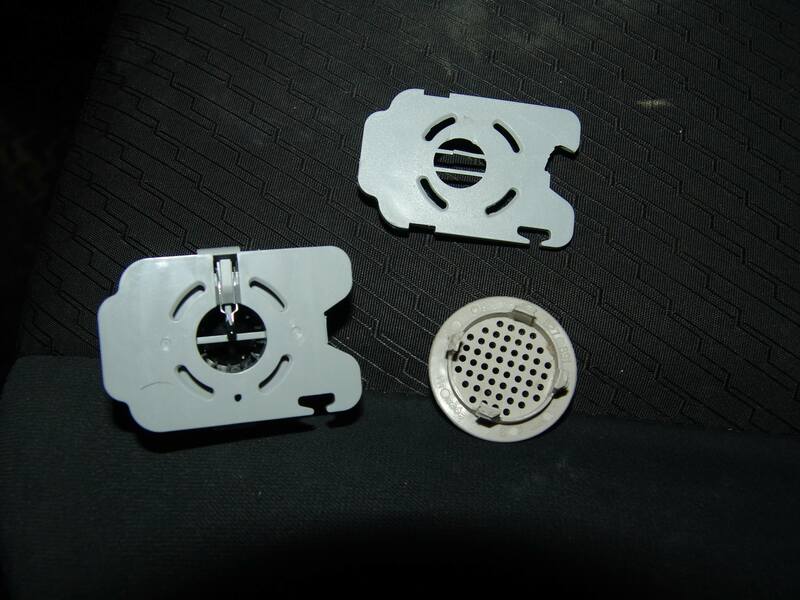 There are a couple of latches that can be pushed in so that the rear/upper housing can be freed from the base plate. Sometimes the housing breaks and sometimes it comes off in one piece. Again I am installing a new one so I do not care if the sensor breaks. The only things that I do not want damage are the headliner and the inner grill/cover. The view with the grill removed. Note the four slots around the outer edge. 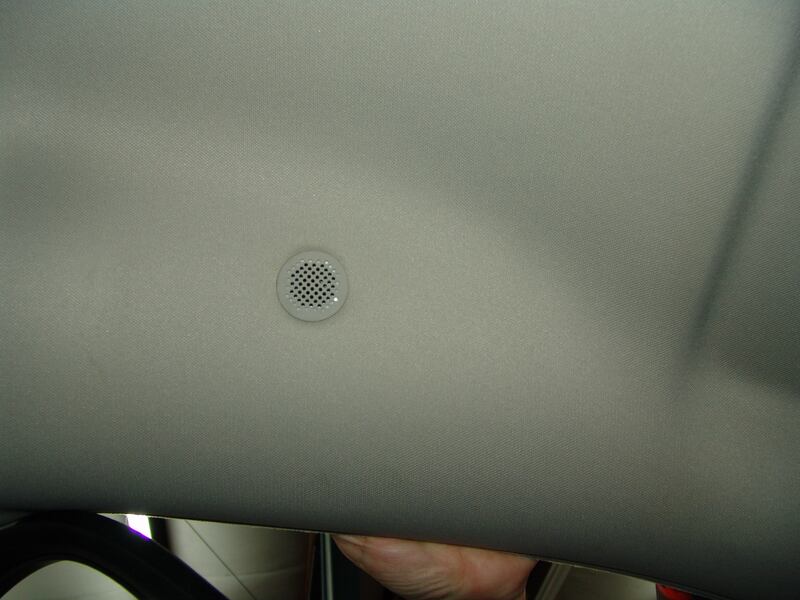 The grill’s locking tabs snap into these slots and are quite difficult to remove without breaking or damaging the headliner surface. 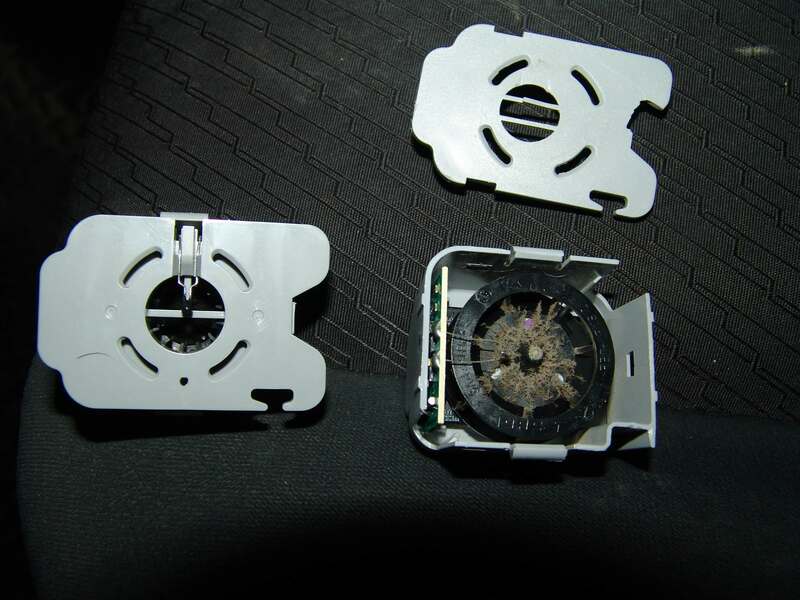 That is why I remove the sensor in pieces. With the upper housing assembly removed you can access the retainers from the top side and push them over so they can be released without damage to the grill. 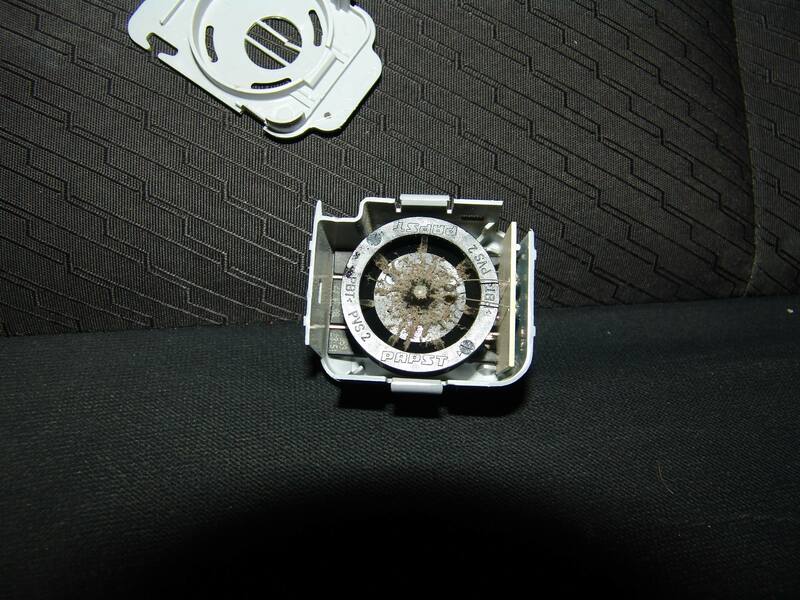 The interior sensor fully removed. The new sensor assembly to the left and the old sensor base plate and grill cover to the right. In the next image you can clearly see what is wrong with the sensor assembly. 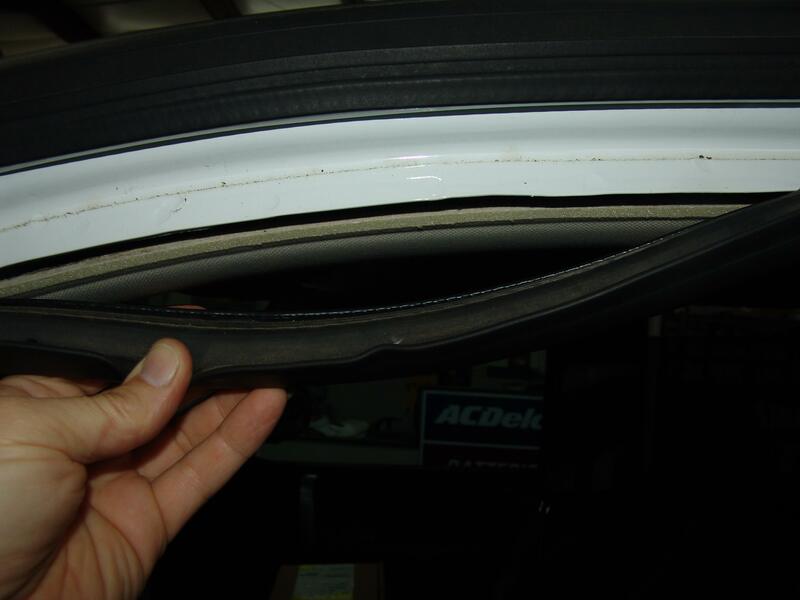 A heavy dust build up on the fan blade reduces the air flow volume and the dust build up on the thermistor insulates it from the incoming air and keeps the temperature reading high than it should be. I know your first thought is why not just us an air hose and blow the dust off without removing the sensor? Notice that there is nothing between the thermistor and the fan blade on the original sensor. Blowing enough air into the sensor to clear the dust would also blow the thermistor into the fan blade. The replacement sensor is assembled differently and blowing it clean would work better.